As rumors build that the Trump administration plans to boot Rex Tillerson from his post atop the State Department in order to replace him with Mike Pompeo, it’s worth examining who would lead the CIA in Pompeo’s absence. Trump is reportedly considering Arkansas Republican Tom Cotton to replace Pompeo as the head of the CIA — a pick that isn’t uncontroversial given Cotton’s deep Trump loyalty and relative intelligence inexperience. The insanity of treating these massively consequential roles as interchangeable aside, here’s a bit of background on Cotton in case the rumors come to pass. An Army veteran, Cotton served two combat tours in the Iraq war where he received a Bronze Star, among other decorations. He served one term in the House before joining the Senate in 2014 where he is serving his first term. What does Cotton do in the Senate? Cotton serves on the Senate Committee on Banking, Housing and Urban Affairs, the Senate Select Committee on Intelligence, the Joint Economic Committee and the Senate Committee on Armed Services. He serves as the chair of the Air Land Power Subcommittee and the Economic Policy Subcommittee. Cotton strongly believes in intensive surveillance measures as a prophylaxis against terrorism — a hardline stance that’s vehemently opposed by privacy advocates. “We’ve deprived very patriotic intelligence officials of critical tools that would keep this country safe,” he told Politico after losing a battle in favor of enhanced NSA surveillance measures. 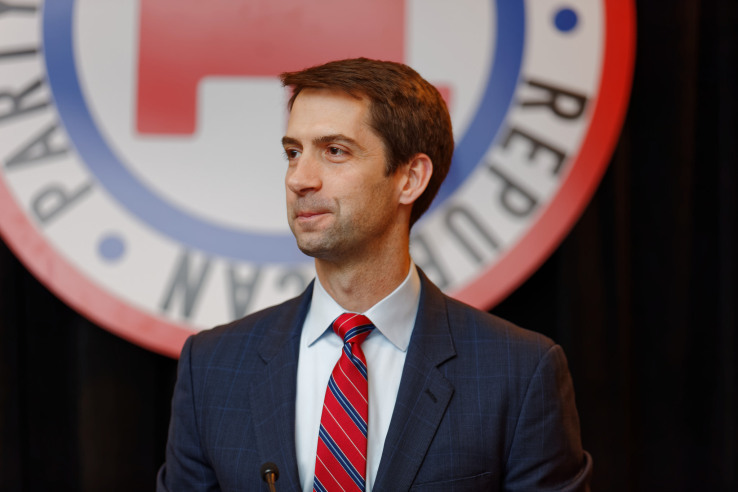 Cotton has expressed concerns about state-level election security, one of the least partisan viewpoints regularly expressed by the Arkansas Senator. “These state governors, legislators, secretaries of state need to understand that if their voting systems are connected to the Internet, and they don’t have an auditable paper trail, that what didn’t happen in 2016 could happen in 2018, which is, say the actual impact on tabulated votes,” Cotton told Politico in a wide-ranging interview last month. In 2015, Cotton joined 20 other Republicans in voting against a Senate amendment that would ban torture, particularly the kind of practices that proved controversial during the Bush administration. Cotton has been described as “the GOP’s staunchest young hawk” and doesn’t have a reputation for working with anyone outside his own party. Cotton, a close ally and a loyalist of President Trump, has recently told anyone standing in the way of Trump’s foreign policy ideas to resign. In later intel hearings, he generally strayed from the task at hand along with the committee’s other deeply partisan Republicans, introducing new threads like a criticism of the FBI allowing Russian diplomats to “wander around the country” in some back and forth with FBI Counterintelligence Assistant Director Bill Priestap. In June 2017, Cotton used his time in a Senate Intel Committee hearing to mock Hillary Clinton for “blaming her loss” on external factors, going so far as to suggest that she has become an “unwitting agent of Russia’s goals in the United States.” In the same hearing, Cotton used some of his other time to question if states and localities that run elections should avoid Kaspersky Labs security products but received no substantive response. While he nearly always lines up with Trump’s more out-there notions, he doesn’t always line up. In June, he voted in favor of Russian sanctions, a departure in his record of voting with Trump 92.3% percent of the time, according to FiveThirtyEight’s tracker of Cotton’s voting record. More footage from Cotton’s committee service is collected online on his YouTube channel.